Brooklyn College scientists, with other experts, to lead a new institute dedicated to revitalizing Jamaica Bay. An aerial view of Jamaica Bay highlights how surrounding neighborhoods are impacted by the condition of the bay and reliant on its fortification. As New York City continues to recover from the effects of Hurricane Sandy, which devastated coastal areas last year, it has become critical to find ways to better prepare the city for these and other extreme weather patterns caused by climate change. 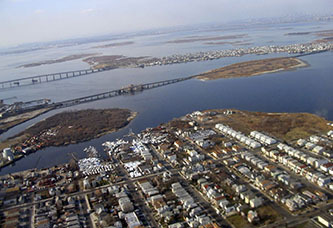 Scientists at Brooklyn College have long been studying the weather's impact on local geographies and have determined that the restoration and fortification of one area in particular—Jamaica Bay—will prove crucial in the quest to ensure that the city, especially its coastal areas, is protected against the ravages of these powerful storms. Jamaica Bay—an 18,000-acre area located at the southern edge of the city, and bordered by Brooklyn, Queens, and Nassau County—is a collection of meadowlands and waterways whose soil erosion has caused the flooding of surrounding populated areas in recent years. The protection and revitalization of the bay is considered essential, not only because it is home to over 325 species of birds, 100 species of fish, 50 species of butterflies, two freshwater ponds, and a wide variety of flora, but also because the entire ecosystem serves as a barrier against the forces of wind and tide, helping to minimize flooding and filter out pollutants. In 2004 Brooklyn College's Aquatic Research and Environmental Assessment Center (AREAC) received the Coastal America Partnership Award for its role in developing and implementing a plan to halt the deterioration of the bay's marshlands. Last year, faculty and students held symposia at the college to further discuss the various ways in which the bay could be conserved. Most recently, when the City of New York sought to consolidate the best scientific minds and resources to find solutions to some of the city's most pressing environmental issues, Brooklyn College science professors, along with other experts, answered the call with a plan that became the foundation for the Science and Resilience Institute. An innovative research center created to promote the importance of fortifying urban ecosystems and surrounding communities against natural forces, the CUNY-led Science and Resilience Institute will focus its efforts on the restoration of Jamaica Bay before expanding outward to other regions inside and outside of the city. The creation of the institute coincides with the city's efforts to boost disaster preparedness, as outlined in Mayor Michael R. Bloomberg's "A Stronger, More Resilient New York" plan, released June 11. The plan evolves out of the mayor's personal commitment to sustainability as shown by his previous PlaNYC initiative. The Science and Resilience Institute will continue in that tradition as an integral part of the city's readiness initiatives. 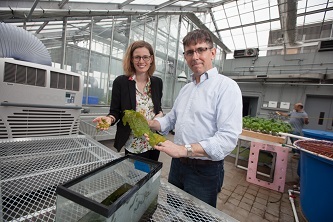 Assistant Professor Brett Branco and Ph.D. candidate Annesia Lamb inspect Ulva seaweed, commonly found in Jamaica Bay. Assistant Professor Brett F. Branco from Brooklyn College's Earth and Environmental Sciences Department worked together with John F. Marra, director of AREAC; William Solecki, director of CUNY's Institute for Sustainable Cities; and John Waldman, Queens College professor of biology, responded to the city's request for proposals. "The beauty of the institute is that it will take all of the stand-alone environmental projects scientists have been working on and ensure that one central entity is aware of all of the efforts," says Branco. "The institute becomes a repository of all this knowledge and it all gets incorporated into a new model on how urban resilience works and how restoration should be done." Scheduled to open in the fall of 2013 in a temporary space on the Brooklyn College campus, the institute will also host visiting scientists and provide facilities for faculty, students, and visitors to meet, discuss, and share ideas. Brooklyn College Provost and Senior Vice President for Academic Affairs William A. Tramontano—who, with CUNY Vice Chancellor of Research Gillian Small, managed the presentation of the proposal to the city—considered the long-term benefits and impact of the institute. "The institute is a rare and visionary opportunity for work that will not only transform the city and set the standard for the environmental practices nationwide, but will also provide our students the kind of twenty-first-century learning, and access to valuable resources and expertise that will prepare them for leadership in the industry." "Jamaica Bay is one of the greatest natural treasures any city has within its borders," said Mayor Michael R. Bloomberg during a press conference announcing the new initiative at Riis Landing in Rockaway, New York, in August. "The new consortium we're announcing today is an all-star team of research institutions and nonprofits who will do important work to protect and preserve urban ecosystems from development and from the effect of climate change." The institute—still under development—includes many of the tri-state area's key academic and nonprofit institutions: Columbia University's Earth Institute and Lamont-Doherty Observatory, Cornell University, NASA Goddard Institute for Space Studies, New York Sea Grant, Institute of Marine and Coastal Sciences at Rutgers University, Stevens Institute of Technology, Stony Brook University, and the Wildlife Conservation Society. "CUNY is proud to lead a consortium of world-class institutions in the new Science and Resilience Institute," CUNY Interim Chancellor William P. Kelly said. "Together with our distinguished partners, we will engage in a groundbreaking effort to revitalize the Jamaica Bay ecosystem. The Science and Resilience Institute's first symposium, "Urban Resilience in an Era of Climate Change: Global Input for Local Solutions," will be held on October 17 and 18 at Kingsborough Community College.